A scarce and unusual 1597 Ptolemaic map of what constitutes modern day Iran, Pakistan and Afghanistan. Presented on a trapezoidal projection with bold mountain ranges dividing the region. This map was engraved by G. Magini and G. Porro based upon the 1561 Valgrisi/Ruscelli edition of Ptolemy's Geography. Shortly after Magini issued his edition of the Geographiae in 1596, Petrus Keschedt, a German publisher operating out of Cologne, copied it and began issuing his own pirated editions. In November of 1597, no less a figure than Abraham Ortelius spotted the pirate. Ortelius informed Magini and, in the face of legal action, Keschedt stopped publishing the atlas until 1608, at which point he recut the plates and issued a new edition. The 1596 Magini edition of Ptolemy's Geographiae was the first small format edition of Mercator's Atlas. Claudius Ptolemy (83 - 161 AD) is considered to be the father of cartography. A native of Alexandria living at the height of the Roman Empire, Ptolemy was renowned as a student of Astronomy and Geography. His work as an astronomer, as published in his Almagest, held considerable influence over western thought until Isaac Newton. His cartographic influence remains to this day. Ptolemy was the first to introduce projection techniques and to publish an atlas, the Geographiae. 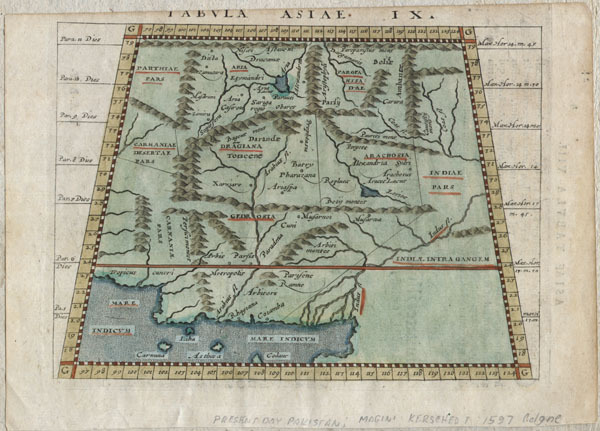 Ptolemy based his atlas on the "Geographiae" of Strabo, the cartographic materials assembled by Marinus of Tyre, and contemporary accounts provided by the many traders and navigators passing through Alexandria. Ptolemy's Geographiae was a ground breaking achievement far in advance of any known pre-existent cartography, however, it was not without flaws. In a masterstroke of ego that would last over 1,500 years, Ptolemy filled the many unknown and unexplored lands with mountains, lakes, and rivers that he merely assumed must exist. His other great error involved his use of the Cape Verde Islands as a Prime Meridian, thus wildly over estimating distances east of this point, and conversely underestimating the distances west. The ultimate result of this error was Columbus's fateful expedition to India in 1492. In any case, though the text of Ptolemy's Geographiae did survive, the maps that supposedly accompanied it did not. The earliest known Ptolemaic maps are in manuscript format and date to approximately 1300. Most of Ptolemaic maps that have come down to us today are based upon the 1477 Bologna edition of Ptolemy's Geographiae. Giovanni Antonio Magini (June 13, 1555 - February 11, 1617) was an Italian astronomer, astrologer, cartographer, and mathematician. Born in Padua, he completed his studies in philosophy in Bologna in 1579. In 1588 he was chosen over Galileo Galilei as the chair of mathematics at the University of Bologna after the death of Egnatio Danti.Magini was a prolific writer, putting forth theories of celestial motion (he was a supporter of a geocentric solar system), the use of quadrants in surveying and astronomy, and trigonometry. In cartography, his life’s work was the Atlante geografico d’Italia, published posthumously by his son in 1620. This work was intended to include maps of every Italian region with exact nomenclature and historical notes. He was also very interested in topics that would be considered pseudoscientific today, particularly astrology (he served as court astrologer for the Duke of Mantua) and metoposcopy. Petrus Keschedt (fl. c. 1596 - 1598) was a 16th century engraver and publisher based in Cologne, Germany. He is best known for his nefarious piracy of Giovanni Magini's 1596 issue of Ptoloemy's Geographiae. Good condition. Upper margin narrow, cutting slightly into title text, as issued.